Get double the grow room assistance with this waterproof alternative to metalized film. Unroll this two-sided film and custom fit your indoor garden, eliminating concerns over whether you've got afternoon-facing light or a climate that supports your preferred greenery. Use the white side for walls and floors, taking advantage of the material's 90 percent reflectivity. When you want to block out light and sun, use the light-resistant black side. Adding this poly film to your walls requires no structural changes—you'll leave your place exactly as you found it. 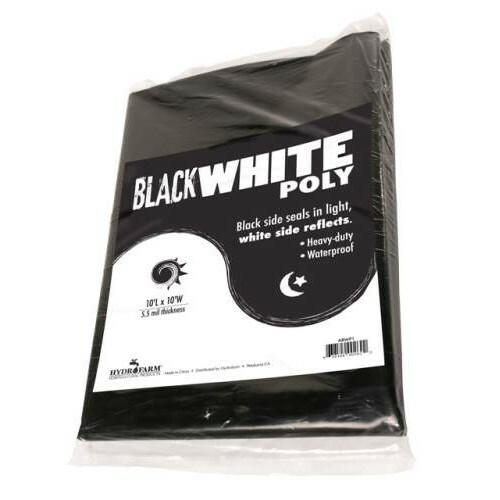 Instead of expensive lighting and heating additions, rely on black and white poly.